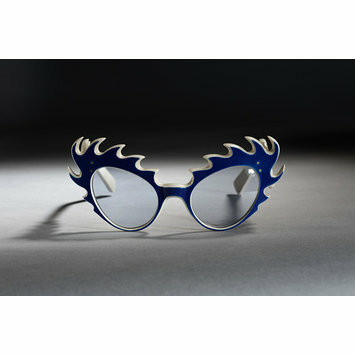 The eyewear firm Oliver Goldsmith created this glasses frame in the 1950s. Philip Oliver Goldsmith, a salesman for a small optical firm, founded his eyewear company in London in 1926. In 1935 his son Charles Oliver Goldsmith entered the firm with the aim of making glasses a fashion item. From the company’s offices in Poland Street, his sons A. Oliver and Ray Goldsmith built upon the company’s reputation for attention-grabbing designs and solicited celebrity endorsement for their products. Key clients included Lord Snowdon, the actress Diana Dors, Princess Grace of Monaco and Diana, Princess of Wales. This example shows Charles Oliver Goldsmith's flair for design. It is one of numerous styles the firm offered as an alternative to the practical eyewear available at the time. Though whimsical, with its fanciful, exaggerated cat-eye shape, this design was eminently wearable. 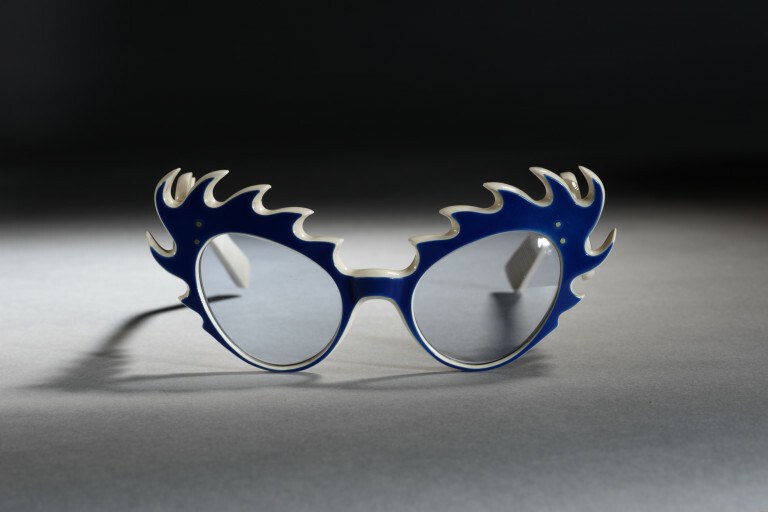 While the resulting design is distinctive, it was challenging to make at a time when such frames were crafted by hand. Plastic sunglasses with exaggerated scalloped edges. Hand-cut plastic with a blue veneer laminted onto the surface.